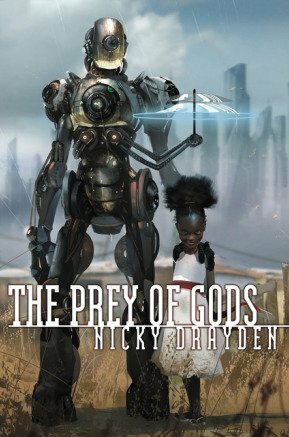 Nicky Drayden’s The Prey of Gods tells a story of a futuristic South Africa where things have seemingly gotten better. Almost everyone has a personal robot to attend them, genetic engineering is making the economy thrive, and the government is learning to harness renewable energy. Yet, an ancient demigoddess wants to return to her former glory by preying on the lives of humans. The only things standing in her way are four extraordinarily gifted humans and a highly intelligent personal robot. Out of everything, the main protagonists are the most memorable aspect of the entire book. These characters include: Muzi (a gay teen with the power to control minds), Nomvula, (a young winged girl who can destroy an entire town), Stoker, (a closeted trans council person who dreams of being an entertainer), and Riya (a pop star hiding from her own pain while thriving off others). The four main protagonists undergo powerful personal journeys that involve embracing their special abilities and their true selves. Each of them lives a double life due to gods that are literal and metaphorical. The metaphorical gods that prey on them include things that are upheld or worshiped by society, such as masculinity, drugs, family ideals, and different types of power struggles and abuse. Other important characters include the power-hungry demi-goddess and a personal robot that can think for itself. While the robot is part casual observer and part active player, the demi-goddess literally inspires fear and awe as a fashionably dressed, manipulative villain. Despite being non-human characters, they manage to display some of the best and worst parts of humanity. Of course, the characters wouldn’t be great without some interesting mythology and world building. Pulling off a blend of sci-fi and fantasy requires an intricate balance of both genres. The mythology is incredible because it reads like a classic tale of gods and creatures. Yet as wonderful as the fantasy elements are, the sci-fi aspects of the book could’ve used more development. When it comes to the sci-fi parts of a futuristic South Africa, there isn’t enough explanation for why society is the way it is and how it affects people besides the main characters. An example of the lackluster world building is in Nomvula’s town. Out of all the places in the book, it is the only place without functional technology. A solar well is broken and no one has a personal robot, but no one outside the town thinks about improving things. Despite the lackluster world building, the plot managed to be a thrilling adventure that is introspective, action-packed, and entertaining. Once you get attached to one or more of the characters, you will want to keep turning the page to find out what becomes of them. Although the various character points of view can be a bit disorienting, all of them come together to tell a great story.